Canon was offering drivers only for Windows and Mac previously. Now, it is also providing drivers for Ubuntu. So, you can install the driver files on your system, connect your printer, and start printing. Install Canon printer driver in Ubuntu is very simple. Steps to connect the printer and install the driver are given on this website. You can make use of it to download the drivers on your system and install it successfully. Initially download the suitable driver for your OS version, install it, and connect the computer to your printer. Your printer will be ready to use. Verify if you have a high-speed Internet connection to download the driver and install it. Make sure your printer is connected to a wireless network. Check if you have enough memory space to save the driver file on your system. Ensure that the downloaded file is compatible with your version of OS. Know the location of the file properly to select it easily during installation. Key in the command that is suitable for your Canon Printer. Examine the terminal window to see if you have entered the correct command. Add your printer and start printing. Point 1: In the first step, press the Ctrl+Alt+T buttons simultaneously. The Terminal will open. After it opens, type sudo add-pt-repository ppa:inameiname/stable and hit the Enter button present on the keyboard. Point 2: In the next step, key in your password when it prompts and press the Enter button again. After carrying out this step, the PPA repository will be added to your system. Go to Utility Dash and select Synaptic Package Manager to open it. If your system does not display any result, then go to the Ubuntu Software Center and search for Synaptic Package Manager and install Canon printer driver in ubuntu. Point 3: Next, tap the Reload button in order to refresh the system cache before installing. If you want to install a printer driver, then type cnijfilter in the Quick Filter Box. You can also install the ScanGear if you specify scangearamp in the Quick Filter box. Type any one command based on your requirement. Point 4: From the list of packages displayed, you should select a driver that matches the device you are using. Select the Mark for Installation option after right-clicking on the correct package. Point 5: Tap the Apply button to install the package you have chosen on your system. 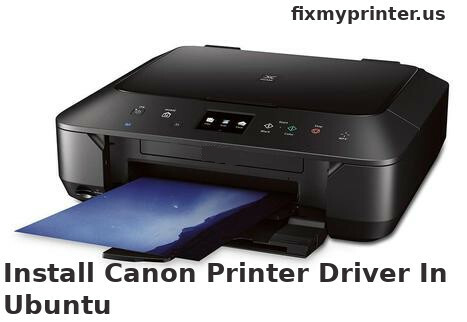 Use the same procedure to install Canon printer driver in ubuntu and the ScanGear on your computer. Once you install the necessary drivers, you can connect your printer to the computer. To do so, go to the bar available at top of the screen and choose the system Settings option and then select Printers. Point 6: Tap the Add option; choose the Find Network Printer option to search for the list of available printers. After searching, your computer will display a list of printers to choose from. Modify any settings in the Installed Options page if you want to. You can change the Printer Name, Description, and the Location. Click on the Apply option to finish adding your printer. Perform the Printers Utility test to see if it is working properly. Point 7: If you have installed the scanner driver, then open the Simple Scan Utility and choose your scanner from the menu. Go to Documents and then choose Preferences. Select the scanner and test it by scanning a document. Point 1: From the bar present at top of the home screen, choose System Settings and then select Printers option. Tap the Add option and choose the Find Network Printer to find your printer. Click the Find button after specifying the IP address. The system will start searching for available printers. Once the result is displayed, choose the printer of your choice. Point 2: Click the Forward option, and the search for drivers will begin. Select the driver from the list and install Canon driver in ubuntu on your system. The Installed Options can be used to customize the page if you want to. Point 3: Modify the name of the printer, description, and the location of the printer. Tap the Apply option to save the settings and complete the process of install Canon printer driver in ubuntu system.